Second day of the conference at the Seminaris Center of Berlin, and what a day ! Mickael Bolton is famous among the testing community and likes to define himself as an « Agile Skeptic » (in a positive way). He started his presentation by providing us with his personal view of what agile means: the agile manifesto and the adaptability. « Why to test? » « What is quality? » These two key questions allow him to clarify the tester activity, an activity primarily focused on adaptability and value, not on quality assurance. Then Mickael explained his position on recurring questions: acceptance tests (that he prefers to call « rejection checks »), regression tests (« still the biggest risk with agile practices ? »), exploratory testing, automation (« only a tool »). His opinions were very clear-cut. Very interesting ! Then Gojko « dynamite » Adzic entered the arena using skillfully irony and second degree in a thunderous show of 30 minutes. ! Not much to add: rather watch these selected pieces! 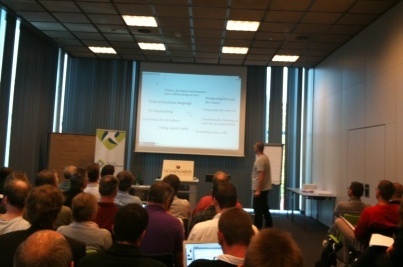 He started his presentation with a description of some agile values: teamwork, simplicity, flexibility, feedback. The critical issues he identified: customer involvement, testing as a team, test strategy, requirements and tools. 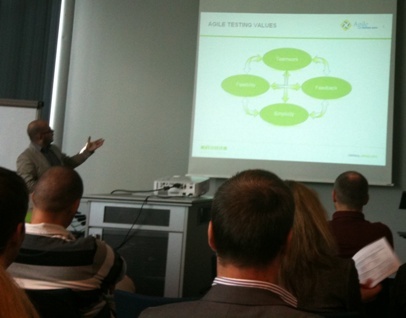 This is what Anko discussed with the 5 Pitfalls of Agile Testing, and the various options to mitigate them. 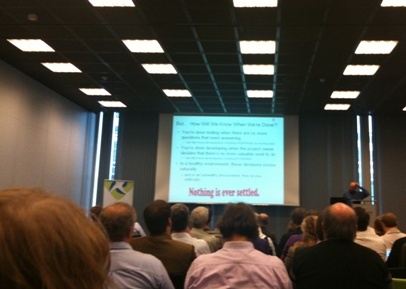 Afternoon keynote: Agile Testing Certification – How could that be useful ? (By Stuart Reid, founder of the ISTQB). Stuart started by saying that the title of his session was a question and that he just wanted to open the discussion. 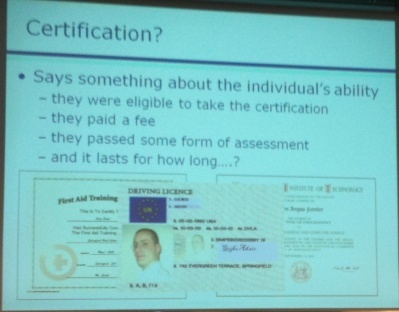 He first gave an overview of existing certifications (both agile and testing). 2 or 5 days Agile Alliance certifications « took a shot ». Then Stuart spent the 45 minutes to discuss the who, when, why, how of new (potential) agile testing certification and course… To be honest, I’m not convinced by the speech and not convinced by a new agile testing certification. 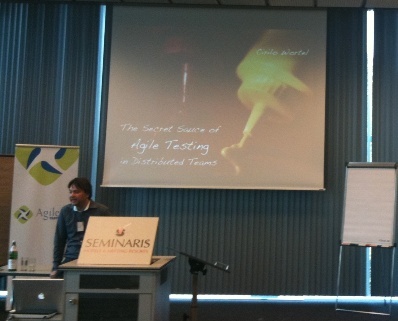 Descriptions of the sessions « The secret sauce of agile testing in Distributed Teams » and « Implementing collective ownership test » interested me. For the first presentation, my opinion is that the real discussion about « agile testing with distributed teams » has been slow to arrive without being really detailed. Testers make a killer proxy! The presentation of Eric Jimminck left me a bit perplexed. 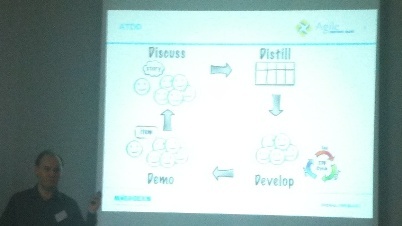 It started well with relevant reminders on ATDD and its core principles. Eric’s conclusions on the organizational impact of such an approach were interesting, however the three examples described did not convince me. I did really not understand what he wanted to demonstrate. Key benefits? Key points? The last keynote of day lived up to its promises. With precision and effectiveness, Janet first made the parallel with childhood, where learning and curiosity are KINGS! Why people want to learn? What skills do they need ? Janet insisted on these general but critical skills: problem solving or system thinking. 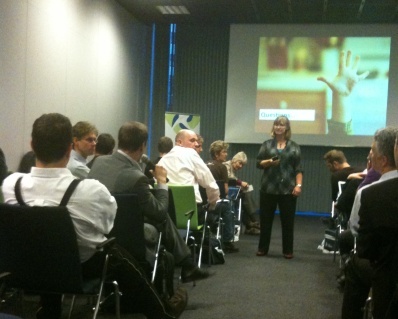 But, she did not forget two agility core values: Feedback and Communication. And I agree completely on the crucial role on these two elements for the agile teams.